Introduction – Vilappakkam is a small town in near Arcot in Vellore district of Tamilnadu. The hilly area, known as Pancha Pandava Malai, seems to be a flourishing Jaina center from ninth to eleventh century as evident from inscriptions on and near this area. The name Pancha Pandava Malai is associated with Pandavas, the heroes of Mahabharata, however this association is just because of some tradition to assign monuments to those people to show the antiquity of the monument. Another local name of the hill, Tiruppamalai, is evidently derived from the original name Tiruppanmalai, ‘the scared milk hill’. As per an inscription of Chola king Parantaka I, found in a structural temple in this village, it is suggested that in the first half of tenth century, this town was under the strong influence of the Jaina ascetics. The number of Jainas were so much that they needed a preceptor in the person of Arishtanemi-pidarar of Tiruppanmalai, whose female disciple sunk a well in the village intended for the nunnery of the place. The name of the female disciple, who was a nun, is given as Pattinikkurattiyar in the inscription. Though few scholars assign the cave temple at the base of the hill to Mahendravarman Ihowever there is no inscription of this king to support this theory. 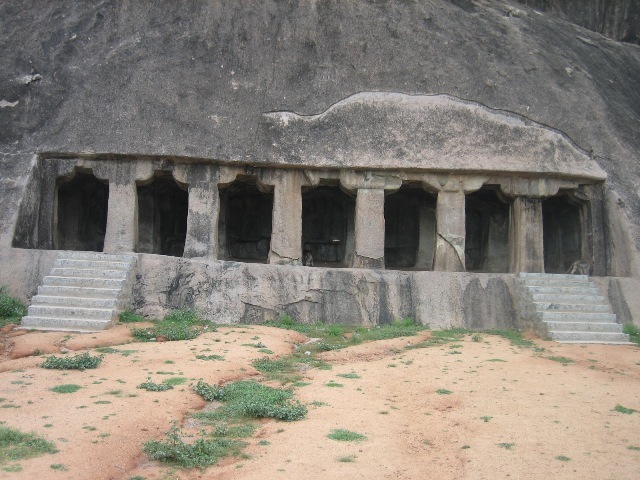 Cave Temple – One of the largest cave excavation among the Mahendra style caves, this east facing cave is excavated at the foot of a large hillock. This cave is excavated about 4.5 feet above the ground level. There are two staircases, one on north and another on south, however these were not carved out of native rock. The front façade is supported on six pillars and two pilasters. This façade is carved little backward from the base. There seems to be no intention to carve dvarapalas as there is no space left on the sides beyond pilasters. The pillars are uniformly square from top to bottom. Pilasters are similar in the style as that of the pillars. There are curved corbels above the pillars and pilasters, another style mostly seen in Mahendra caves. Behind this front row of pillars, there is another row of six pillars and two pilasters located half way between the back wall. These two rows thus form an ardha-mandapa and mukha-mandapa. This arrangement of two bays is also seen in many caves of Mahendravarman. There are seven niches carved out on the back wall of the cave. The niches are 5.5 feet by 2.5 feet in measurement with the depth of about 1 feet. All the cells are empty, however there is a sill in all the cells, perhaps to support a wooden or metal image. The side walls are left with square uncarved blocks, which suggest that the plan was to excavate these little deeper intended for a cell probably. Dvarapalas of the shrine – There are no dvarapalas carved in this cave. There is no space left, on front façade, beyond the pilasters for the dvarapalas. The cells inside on the back wall also do not have much space to have dvarpalas. Whether the side walls were reserved for these, is not very clear as the side walls are left with uncut square blocks. Inscription – There is no inscription found in this cave. Authorship of the cave temple – There are few points to ponder here. 1. Many of the cave temples of Mahendravarman are located near Jaina sites. This cave temple is also associated to Jainas, however whether it was done in later times or during the construction is not very clear. There is one theory of Mahendra being Jaina before converting towards vedism/Shiva, hence location of his shrines near the Jaina sites are quite appropriate. 2. However the pillars are not of the characteristic style of Mahendra. K R Srinivasan attributes this construction to be in later times of Mahendra, however in such a case why very primitive pillar style was selected? 3. We always say that Mahendra was the initiator of the cave temple construction in Tamilnadu. Once this statement is accepted then we try to assign all other theory surrounding this theory. I want to be little brave and say what if that theory is not correct? And there were caves excavated before Mahendra such as this one at Vilappakkam? Its very primitive style clearly shows that this was an earlier construction, isn’t it? Mandagapattu inscription did not clearly state that it was the first cave temple, hence the deduction made over that inscription could be wrong as well. I leave the discussion open here, and would update this article once I get more information on this. Other monuments – On the top of this hill is a natural cavern which is partially converted into a tarn by the construction of a retaining wall. The rest of the natural cavern is turned into a mosque however it seems that it is not under worship anymore. As per an inscription, this hill is referred as Tiruppanmalai and there are references of a figure of yakshi, Naganadi and a Jaina thirthankara. The figure of yakhsi is carved on the rock face near a pool of water, under the another rock forming the roof of the cavern. She is shown sitting under a tree with one leg on the ground and one leg bent on the seat. She is holding a chauri (fan). There are four figures around her, one on her right and three down on the ground. Among the three on the base of the seat, one is shown standing, another sitting over a horse and the third one standing seems to be a female figure. There is a Jaina tirthankara figure on the top of the rock face. He is shown seated in yogasana. Above his head is shown triple chhatra (triple umbrella) and on either side are shown two chauries (fans) without attendants. On southern face of the same rock we see two carved figures, one of naked male figure and another of a quadrupled animal, resembling more like a dog rather than a tiger. Tiger is thought as it was the royal emblem of the Cholas, however this particular animal figure does not look like a tiger. Inscriptions on the rock face – There are two inscriptions on this rock face, one of the Pallava king Nandivarman Pallavamalla and another of the Chola king Rajaraja I. There is one more inscription, of the Chola king Parantaka I, found on a stone slab inside the structural temple of this village. We will see the inscriptions in details. Inscription of Nandivarman – This inscription is stated to be carved above the figure of yakhsi, however I was not able to locate this. It might be quite worn out or I did not look at the right place. Whatever be the case, we have its translation in Epigraphia Indica, so we will refer that here. This inscription is engraved in very archaic Tamil characters and runs in four lines. In the fiftieth (year) of Nandippottarasar, Naranan (Narayana), the son of Maruttuvar of Pugalalaimangalam, caused to be engraved an image of Ponniyakkiyar, along with the preceptor (guruva) Naganandi (Naganandin). Abstract – The five figures, carved on the rock face near the water pool, seems to be executed on the order of a vassal of the Pallava king. The female yakshi figure represents Ponniyakki (jwalayakhsi) and the male standing figure near her seems to be the referred preceptor, Naganandin. The Pallava king, in whose fiftieth year this inscription was carved, seems to be Nandivarman II Pallavamalla (732-796). While editing this inscription, V Venkayya suggested that perhaps this inscription was engraved after the death of the king as fifty years is a very long rule, not usually seen in Indian history. However it seems that his assumption is wrong, as later studies in epigraphy proved that this king has a long reign. K R Srinivasan has put his reign of about sixty five years, on the basis of various inscriptions found. Inscription of Rajaraja I – This inscription runs for eleven lines and is in good state of preservation. Few characters in the start of last line are lost, otherwise the whole inscription is very readable. Line 1. Hail! Prosperity ! Line 2. In the 8th year 9of the reign) of king Rajaraha-Kesarivarman – the Lataraja who reigned in former days, had taken way the ‘cost of camphor’ from the tax-free pallichchandam (in) Kuraganpadi, which was enjoyed by (the shrine of) Tiruppanmalai in Perun-Timiri-nadu, (a subdivision) of Paduvur-kottam. Line 11. “The dust of the feet of one who protects this charity, shall be on my head”. Abstract – This inscription is engraved in the eight year of the Chola king Raja Raja the Great, who is referred as Rajaraja-Kesarivarman in this inscription. The execution was done by some Lataraja-Vira-Chola, who was some vassal under Raja Raja. On request of this vassal’s queen, Vira-Chola assigned to the god of Tiruppanmalai, which was under Perun-Timiri-nadu, a subdivision of Paduvur-kottam, a certain income from the village of Kuraganpadi. This Kuraganpadi may be the current Kurambadi village, 2 miles east of Pancha Pandava Malai. Though the inscription does not explained who the god of Tiruppanmalai, however from the previous inscription of Nanadivarman and the term pallichchandam used in this inscription suggests that the shrine and god were of the Jainas. The income assigned to the shrine was consisted to two items, one the cost of the camphor (karpura-vilai) and another was taxes on unauthorized looms (anniyayavavadanvirai). It seems that the sale of camphor was taxed in those times and those taxes were given to the shrine. There seems to be some categories of looms which were considered as unauthorized. It seems that few number of the looms were authorized to work in a village and those work towards the requirements of the village. If there is setup any unauthorized loom in the village, then this needs to pay tax for this. I am little confused, if such a loom was taxes, then why it was called as unauthorized? Was the government collecting taxes on unauthorized enterprises? How to Reach – Pancha Pandava Malai is about 6 km from the town of Arcot. Take a left turn from Vellore Main Road in Arcot towards the Arcot-Kannamangalam Main Road. The hill is located on your right hand. The cave temple is visible from the road, so you will not miss it.